As the government shutdown has now spanned over three weeks, becoming the longest shutdown in history, IAVA continues to pressure the President and Congress to fix this mess until it’s resolved. Grassroots members nationwide have been mobilized on the ground and online to take action–and to support their fellow veterans if our government will not. 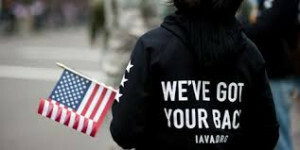 IAVA has also activated our dynamic Rapid Response Referral Program (RRRP) to help those veterans impacted by the shutdown. IAVA’s innovative social workers are trained to help veterans and military family members access critical resources to ensure stability, especially during times when the government will not. For those whose livelihood and well-being are being impacted by this government shutdown, RRRP is here to help. When a service member, veteran or family member reaches out to RRRP they will receive a response within 1-2 business days and will get linked up with one of our Veteran Transition Managers (VTM). RRRP’s VTMs are all masters-level social service professionals and are savvy in ensuring that our client’s needs are effectively met — whether that is to provide connections to partner financial assistance resources, navigate benefits, ensure food and shelter for the entire family, or access quality mental health support, to mention a few. RRRP is here for anyone that is being impacted by this government shutdown. Reach out to us today. RRRP is here to help. Reach out to us today.